Our skills in complex I.P. are demonstrated in various ways. We have experience in a wide range of technology and a small sampling of our work is listed below. Mechanical patents, biomedical patents, utility patents associated with design patents, computer program patents, sometimes called business method patents, financial product patents, complex serial patents and process patents associated with utility patents covering structural aspects of the invention are listed in the tables below. We also include samples of sound trademarks and examples of trade dress. Design patents protect the exterior, ornamental features of a product. Trade dress refers to the look, shape, ornamental theme or color combination of a product. If consumers distinguish your goods from your competitor, it is a protectable I.P. right. Trade dress is a branch of trademark law. If consumers associate the trade dress with those distinctive features of the goods, the look, shape or color may be a registrable trademark. Trade dress does not protect functional aspects of the product. U.S. Patent No. 6,782,144 by Bellavita et al., “Document Scanner, System and Method,” issued August 24, 2004. U.S. Patent No. 7,131,589 by Asplanato, “Document Transport Apparatus and Method for Barcode Readers,” issued November 7, 2006. U.S. Patent No. 6,364,853 by French et al., “Irrigation and Suction Valve and Method Therefor,” issued April 2, 2002. U.S. Patent No. 6,918,902 by French et al., “Irrigation and Suction Valve and Method Therefor,” issued July 19, 2005. U.S. Patent No. 5,343,867 by Shankar, “Method and Apparatus for Detecting the Onset and Relative Degree of Atherosclerosis in Humans,” issued September 6, 1994. U.S. Patent No. 6,152,881 by Raines et al. “Calibrated Measurement of Blood Vessels and Endothelium After Reactive Hyperemia and Method Therefor,” issued November 28, 2000. U.S. Patent No. Des. 371,509 by DiStacio, “Threaded Nut,” issued July 9, 1996. U.S. Patent No. Des. 435,102 by Chakoff et al., “Suction-Irrigation Handpiece,” issued December 12, 2000. U.S. Patent No. D435,975 by Ranspach, “Drawing Horse and Drafting Table,” issued January 9, 2001. U.S. Patent No. D447,640 by Ranspach, “Drawing Horse and Drafting Table,” issued September 11, 2001. U.S. Patent No. D441,969 by Ranspach, “Drawing Horse and Drafting Table,” issued May 15, 2001. U.S. Patent No. RE. 35,937 by DiStasio, “One-Way Nut and Bolt,” issued October 27, 1998. U.S. Patent No. 6,302,032 by Ranspach, “Drawing Horse and Multi-Task Work Station,” issued October 16, 2001. U.S. Patent No. 5,864,685 by Hagan, “Increasing Income Trust Computer Transaction System and Insured Investment Account System,” issued January 26, 1999. U.S. Patent No. 5,631,828 by Hagan, “Method and System for Processing Federally Insured Annuity and Life Insurance Investments,” issued May 20, 1997. U.S. Patent No. 6,907,408 by Angel, “Hierarchical Authentication Process and System for Financial Transactions,” issued June 14, 2005. U.S. Patent No. 7,103,915 by Redlich et al., “Data Security System and Method,” issued September 5, 2006. U.S. Patent No. 7,140,044 by Redlich et al., “Data Security System and Method for Separation of User Communities,” issued November 21, 2006. U.S. Patent No. 7,146,644 by Redlich et al., “Data Security System and Method Responsive to Electronic Attacks,” issued December 5, 2006. U.S. Patent No. 7,191,252 by Redlich et al., “Data Security System and Method Adjunct to E-mail, Browser or Telecom Program,” issued March 13, 2007. U.S. Patent No. 6,010,289 by DiStasio et al., “Locking Nut, Bolt and Clip Systems and Assemblies,” issued January 4, 2000. U.S. Patent No. 6,264,411 by DiStasio et al., “Locking Nut Bolt and Clip Systems and Assemblies,” issued July 24, 2001. U.S. Patent No. 6,679,663 by DiStasio et al., “Locking Nut, Bolt and Clip Systems and Assemblies,” issued January 20, 2004. U.S. Patent No. 6,905,297 by DiStasio et al., “Locking Nut, Bolt and Clip Systems and Assemblies,” issued June 14, 2005. Registration No. 1,501,831 for the mark TAN IN A CAN, used in connection with suntan lotion, tanning oil and moisturizing lotion. Registration No. 3,141,178 for the mark SCAVENGER 2000 in the color red, used in connection with water treatment equipment to restore lakes, harbors and waterways consisting of a marine vessel containing an onboard water treatment system which utilizes redundant oxidizers to reduce or eliminate bacteria, e-coli and viruses and improve the water clarity. Registration No. 1,5469,982 for the mark TAN IN A CAN and Container Design, used in connection with suntan lotion, tanning oil and moisturizing lotion. Registration No. 2,988,627 for the mark ALL PRO VAN LINES with the colors blue, red, white and gray, used in connection with moving van services. Registration No. 1,524,083 for the mark Oil Can Container Design, used in connection with suntan lotion and tanning oil. Registration No. 916,522 for THE MARK COMPRISES THE MUSICAL NOTES G, E, C PLAYED ON CHIMES, (NBC Chimes) used in connection with broadcasting of television programs. Registration No. 2,821,863 for the mark NO DRAWING-SENSORY MARK, (AOL – You Got Mail) used in connection with providing multiple user access to computer networks; electronic transmission of data, images, and documents via computer networks; providing online electronic bulletin boards for transmission of messages among computer users concerning computer network communication; providing online computer network facilities for realtime interaction and communication with other computer users; providing information in the field of computer network communications. Registration No. 2,692,077 for the mark NO DRAWING-SENSORY MARK, (Pillsbury Dough Boy Laugh) used in connection with watches; non-metal key chain; cookie jars; Christmas tree ornaments and dolls. The following two cases and the accompanying illustrations show different types of trade dress disputes. A famous U.S. Supreme Court case, Two Pesos, Inc. v. Taco Cabana, Inc., 505 U.S. 763, 773, 112 S. Ct. 2753, 120 L. Ed. 2d. 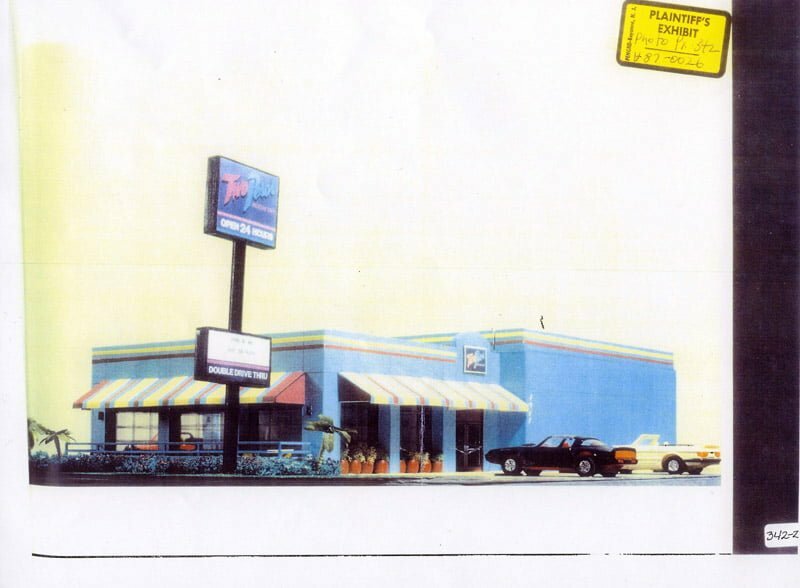 615 (1992), illustrates trade dress of a restaurant protected under § 43(a) of the Lanham Act, 15 U.S.C. § 1125(a). 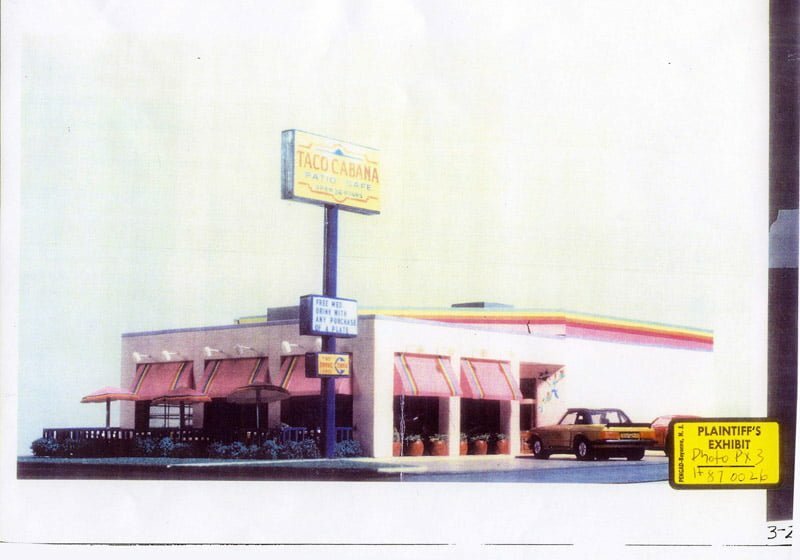 Respondent Taco Cabana, Inc., operated a chain of fast food restaurants in Texas and described its Mexican trade dress as “a festive eating atmosphere having interior dining and patio areas decorated with artifacts, bright colors, paintings and murals. The patio includes interior and exterior areas with the interior patio capable of being sealed off from the outside patio by overhead garage doors. The stepped exterior of the building is a festive and vivid color scheme using top border paint and neon stripes. Bright awnings and umbrellas continue the theme.” Subsequently, Petitioner Two Pesos, Inc., opened its restaurant in Houston with a similar motif. 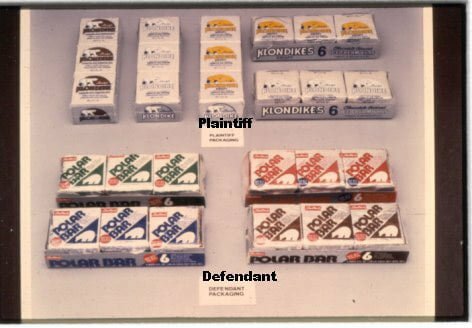 Ice cream bar packaging was the trade dress in controversy between Kraft’s Polar B’ar and Ambrit’s Klondike bar. The district trial court found infringement and the Court of Appeals for the Eleventh Circuit agreed. Ambrit, Inc. v. Kraft, Inc, 805 F.2d 974 (11th Cir, 1986).